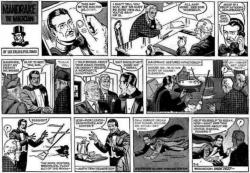 "Task Test" is the 90th Mandrake Sunday story. The story was written by Lee Falk and drawn by Phil Davis. The Chief asking Mandrake to visit him at the station, and introducing his friend Mr Briggs. Then a series of odd things happend to Mandrake, almost like a series of test's. Mr Briggs, a special agent. Chief of ? Miss Ramsdell, a special agent. A neutral nation, unfriendly to US. The story title is taken from the strip of April 29 and May 6, 1962 (Next Week: "Task Test" and Beginning: Task Test). In the first panel in the strip of June 10 there is a poster at the Chief's office: Defend freedom buy U.S. savings bonds. This page was last edited on 11 April 2016, at 12:20.